Pack your bags and come to Reims! The team at the ibis Reims Centre hotel welcomes you and will be delighted to help you discover the treasures of the city of Reims and the surrounding region. Shh! What could be better than a good night's sleep in a cozy bed? Arriving by train? We are right next to Reims Centre train station and only 45 minutes from Paris by TGV train. Arriving by car? A paying outdoor car park is at your disposal. Tired after your journey? 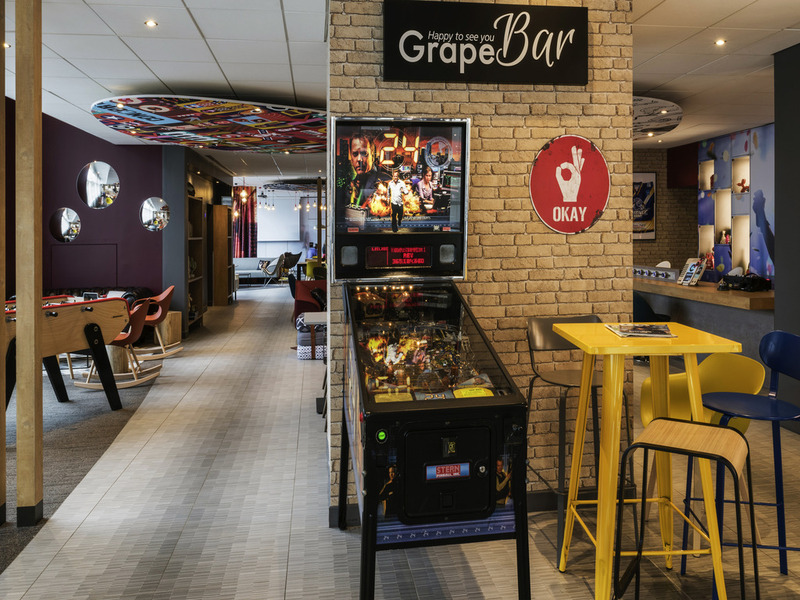 The ibis Reims Centre hotel offers renovated rooms and the Grape Bar that will delight your taste buds with its hearty gourmet menu. Now you can sleep soundly - we'll take care of everything. Sweet dreams! Tourist sites of international renown: the cathedral, the Abbey of Saint-Rémi, Champagne cellars, Rheims Mountain and vineyards. 5 minutes from the city center. 2 minutes from the Rheims Centre SNCF train station. 10 minutes from Rheims convention center. "Effia" paying outdoor car park opposite the hotel. Relax and enjoy a drink in the friendly atmosphere of the Grape Bar. The lively Grape Bar is a true urban refuge that combines beauty, modernity and character in a relaxed, alluring setting. Settle down on our sofas to enjoy one of our sharing dishes or a relaxing drink. Our new Grape Bar welcomes you to work or enjoy a drink with friends around the foosball table or pinball machine. Whether you feel like a snack or a full meal, we are at your service. Eat in or take your food to your room. Make yourself at home!